The day had finally arrived. Jamie and I had decided to get to bed early. We hit the sack around 10PM. We were both so excited that I don't think either one of us really slept until after 11PM. The alarm went off Saturday morning at 4AM. 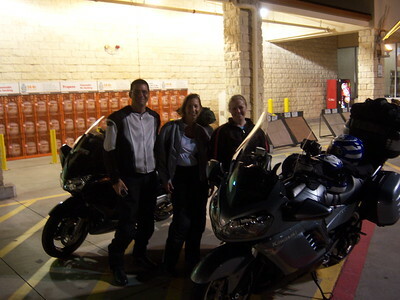 We were meeting Pete & Kim Russo at the Home Depot in McKinney at 5AM. It was supposed to be a warm day and we wanted to beat the heat. We we both excited and had no issue getting to the starting point at the correct time. Pete & Kim were already on site. Everyone had huge smiles on their face. We had been planning this trip for weeks. we were ready to roll. 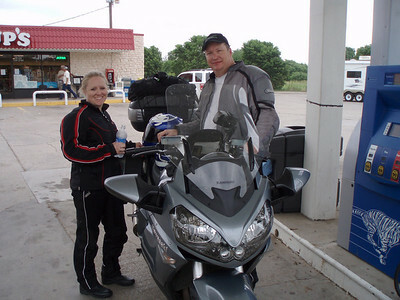 We had decided that we would just slab it out of Texas, getting to Raton as soon as possible. There is not really a pretty way to get out of town. We stopped in Wichita Falls at the Cracker Barrel. 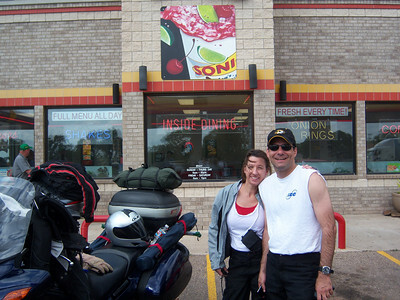 Nothing tastes better than a CB breakfast on a road trip. Nothing really exciting happened on our way to Amarillo. We would ride for 70-100 miles and then take a break. 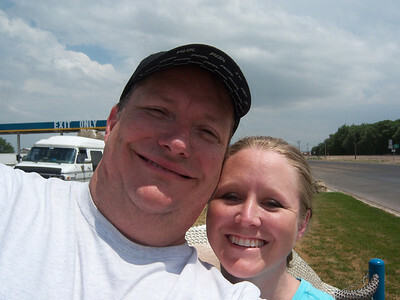 We arrived in Amarillo around 12:45PM. There was a little event that almost happened that I would have never been able to live down. Jamie asked if we should get gas in Amarillo. I said that we could fuel up later as there would be many places to fuel up.. well I was not really correct in that statement. 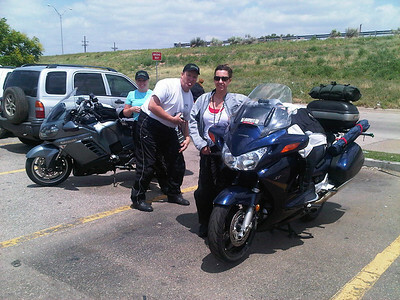 We took US 385 from Amarillo up thru Channing, Hartley and Dalhart. I figured that we could get gas in Channing.. WRONG! So now I have been on reserve for a few miles. We roll into Hartley and there is only a coop station, with no one working and only 87 grade fuel. I had to put in a gallon as I was almost empty. Jamie just looked at me and smiled, she never said it, but I know the words I told you so were on her lips. 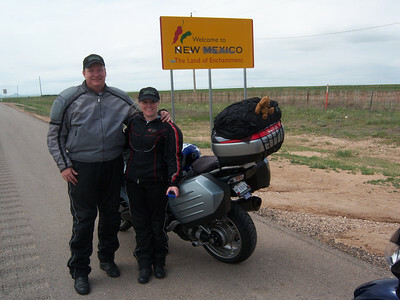 We fueled up in DalHart and then hit the road again. Looking into the horizon the skies were really cloudy and getting dark. It looked like we might be getting some rain. 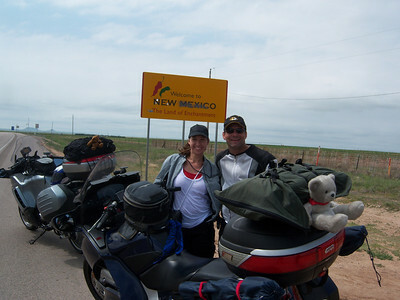 We rolled into New Mexico and after a few shots at the border we headed for Raton. We got into town around 4:30PM. We were staying at the Summerlin RV park and our GPS took us to the wrong place, after a quick phone call and some directions we were sitting in the camp ground. We were so lucky with the weather. The 40 miles outside Raton were very ominous, the skies were dark and we road along wet roads for most of those miles. It never rained on us and we enjoyed the overcast cool temps on the last leg to our camp ground. While setting up our tents we came across a little snake. 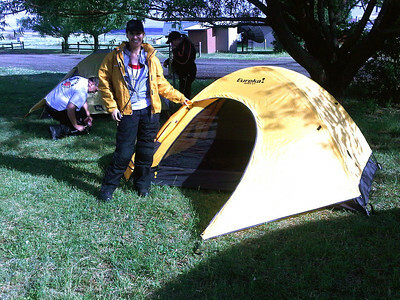 We placed him back in the bushes and moved on with setting the tents up. 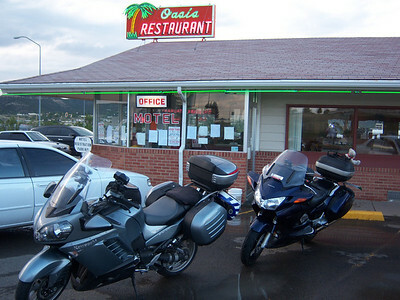 We headed to dinner at the Oasis in Raton. We pulled into the lot and the ground was very wet. I was putting the C-14 on the center stand when we almost had our first disaster of the trip. My foot slipped off the stand and the bike started to fall away from me. Jamie was standing on the other side of the bike and actually threw herself under the bike and kept it from falling. Super Jamie was AWESOME. 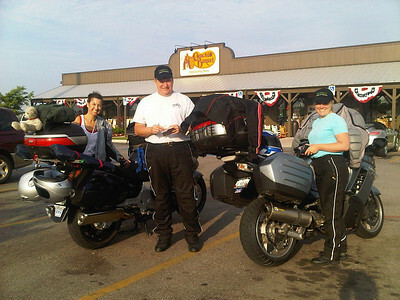 Pete and Kim watched in amazement as we got the bike upright without any damage to the bike or to us. It was a great day! When we got back to the camp site we were exhausted. 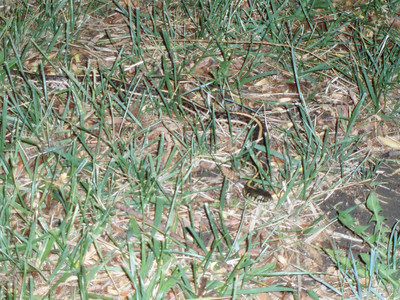 As we were hanging out getting ready to hit the sack, Pete walked across the camp ground and stepped on the snake that we had let go earlier that afternoon. Pete jumped like a little girl and squealed, I laughed my *** off as I ran away under the canopy. We are not the most manly of men around the little forked tongue devil. 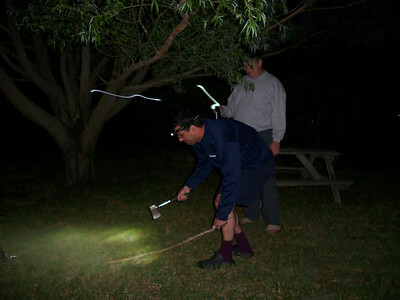 We got rid of the snake (killed it with a hatchet) as we did not want to girls to be afraid during the night. That is my story and I am sticking to it. The first day was awesome. We did not get rained on, we made great time and nothing bad happened. The weather was great on the first night. The temp was a good 45 degrees. We had a wonderful day and we all knew that the trip was only going to get better and better! Here are a few more pics from the day. I will write day two as soon as possible. Stay tuned. 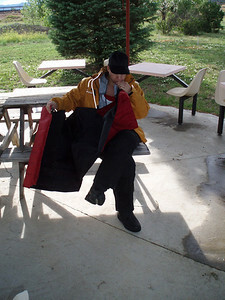 How do you pack tent, sleeping bag, mat and all the clothes and camping accessories on your Concours for 2? Do you have a picture of your bike packed?